If Shahrukh khan can pump iron and build six pack post 40 yrs, being a rockstar should not be that difficult. Well, our Munnabhai is in true rockstar mould. 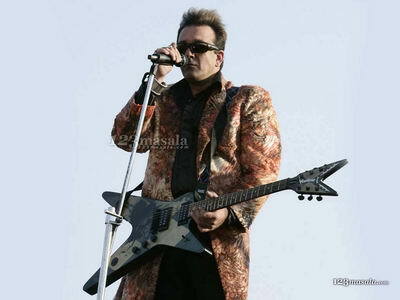 Sanjay Dutt plays a rockstar in a rocking song from movie WoodStock Villa. He has star shaped guitar with long coat to complete the look. He is rocking on song ‘Kyun’ by band Aryans. 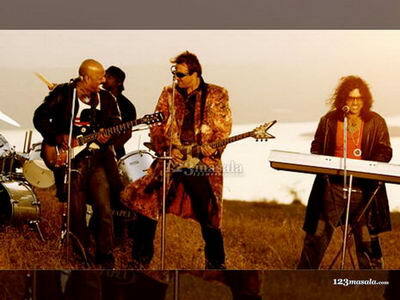 Sanju baba was so impressed with the song, that he could not resists going for that song. Here is upclose look of Sanjay Dutt, the rockstar. [Click on above pics to download as wallpaper] So… did you like this rocking look of Munnabhai? Can he still strike rocking chord at this age?